Daniel Mitsui is an artist quite well known to readers of NLM for his exquisite work in calligraphy and iconography. He was recently commissioned to produce a set of altar cards and went at it with his customary thoroughness, ingenuity, love of detail, and delight in the Gothic aesthetic. I received a set of these cards to examine, and I must say that they are simply stunning. 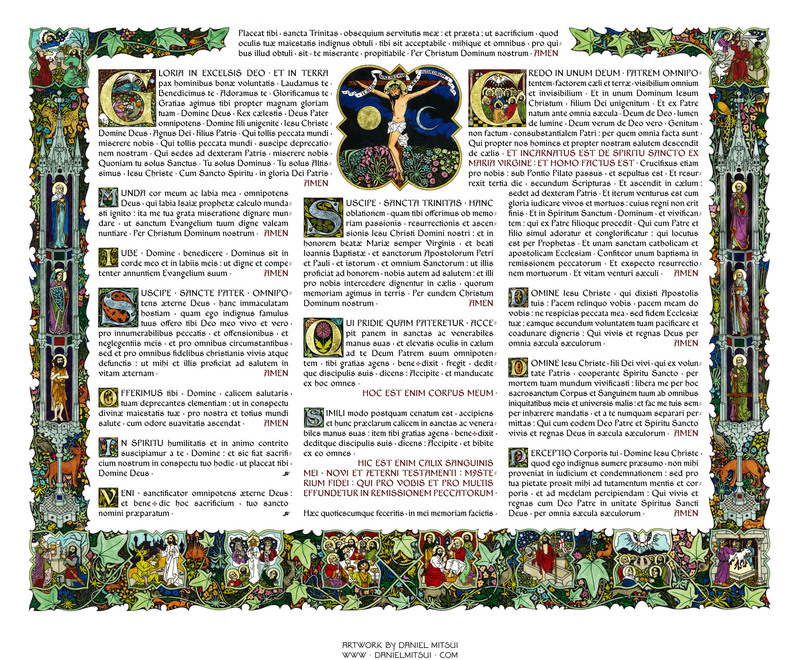 The overall design is harmonious and pleasing to the eye; the font comes across as strong, slightly ornate, and yet highly legible; the illuminated initials add considerable interest; and the iconographic program followed in the ample margins is a microcosm of the entire liturgical year and indeed the history of salvation. 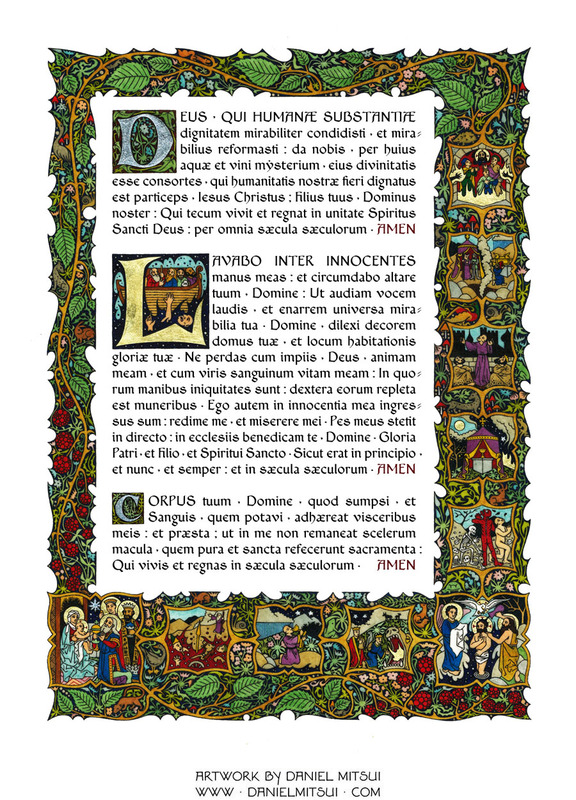 As a teacher, I found myself thinking, “I could teach a catechism course just using these altar cards.” More to the point, they embody the entire Catholic theology of the sacred liturgy. Here are some photos; afterwards I shall quote the artist’s explanation of the iconographic program. The Gospel card and Lavabo card (each 9" × 12"). The artist’s website offers a full explanation of the choice and arrangement of scenes, which evince a deep grasp of liturgical symbolism and patristic commentary. You have to see these cards to believe them. I am looking forward to framing this set for local liturgical use. 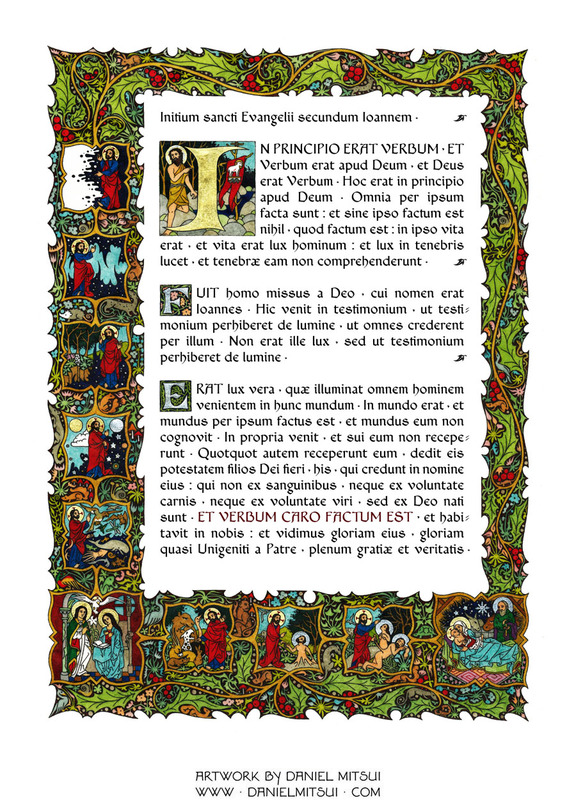 I would certainly recommend these altar cards to priests, deacons, and any laity who are looking for a special Christmas gift for your TLM-celebrating clergy. The commissioned set was drawn in ink on calfskin vellum with gold and palladium leaf details, and hand lettering. What I have photographed here is an open-edition giclée print on Lexjet archival matte paper, with a custom typeface, Benedict, utilized instead of handwritten letters, to improve readability. The cards may be ordered directly from the artist.